October 7, 2017 – NXT Live Event: Jessie Elaban was in a battle royal won by Vanessa Borne. October 27, 2017 – NXT Live Event: Jessie Elaban was in a Halloween costume battle royal won by Shayna Baszler. January 13, 2018 – NXT Live Event: Jessie Elaban defeated Sage Beckett. February 3, 2018 – NXT Live Event: Jessie Elaban and Kairi Sane defeated Reina Gonzalez and Sage Beckett. February 10, 2018 – NXT Live Event: Jessie Elaban defeated Sage Beckett. 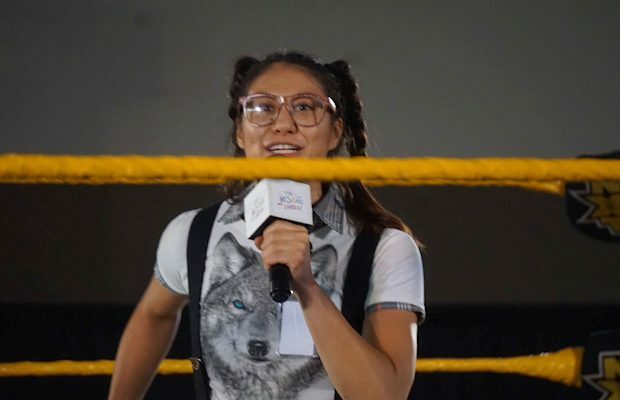 February 23, 2018 – NXT Live Event: Jessie Elaban defeated Zeda by disqualification. April 26, 2018 – NXT Live Event: Reina Gonzalez defeated Jessie Elaban. April 27, 2018 – NXT Live Event: Lacey Evans defeated Jessie Elaban. June 1, 2018 – NXT Live Event: Aliyah defeated Jessie Elaban. July 19, 2018 – NXT Live Event: Lacey Evans amd Vanessa Borne defeated Jessie Elaban and Nikki Cross. July 20, 2018 – NXT Live Event: Jessie Elaban was in the #1 contenders battle royal for the women’s title won by Candice LeRae. July 26, 2018 – NXT Live Event: Jessie Elaban and Kairi Sane defeated Taynara Conti and Vanessa Borne. July 28, 2018 – NXT Live Event: Jessie Elaban and Kairi Sane defeated Taynara Conti and Vanessa Borne. August 10, 2018 – NXT Live Event: Bianca Belair defeated Jessie Elaban. September 6, 2018 – NXT Live Event: Jessie Elaban and MJ Jenkins defeated Kavita Devi and Reina Gonzalez by disqualification. September 13, 2018 – NXT Live Event: Reina Gonzalez defeated Jessie Elaban. September 28, 2018 – NXT Live Event: Jessie Elaban won the #1 contender battle royal for the NXT UK women’s title. Rhea Ripley defeated Jessie Elaban to retain the NXT UK women’s title. October 28, 2018 – EVOLVE 114: Priscilla Kelly defeated Jessie Elaban. January 5, 2019 – NXT Live Event: Chelsea Green defeated Jessie Elaban. February 2, 7, 2019 – NXT Live Event: Chelsea Green defeated Jessie Elaban.